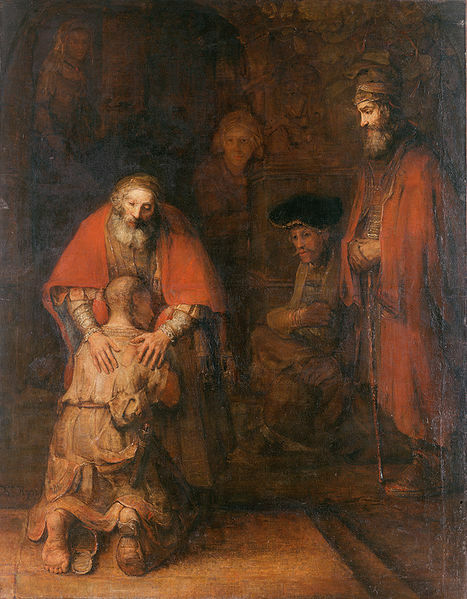 Centuries ago someone came up with the title The Prodigal Son. As a result, much of its original meaning was lost in translation. The parable is not about the son! Most of us don’t need to be reminded of our rebelliousness; our fathers probably even have photographic evidence to prove it. Instead, Jesus gives us a vivid picture of our Heavenly Father and his extravagant love for us. Luke 15 has three parables with a similar plot: a precious object (a sheep, coin, and son) is lost, the concerned party searches for and finds it, and all are invited to rejoice. Jesus uses these three parables in response to the accusation: “This man welcomes sinners and eats with them.” (15:2) Jesus in fact affirms that He welcomes sinners and associates with them and He invites and even commands us to do the same! Our story begins with the youngest son telling the father, “Give me my share of the estate.” He doesn’t ask; he just tells his father to give him what he would get upon his father’s death. In effect, the son is saying, “I wish you were dead!” Isn’t that what we are saying to Jesus every time we sin? And yet Jesus died for us anyway. Without a word of protest, the father gave his son about a third of his property, though he certainly must have known that his son would waste it all. It was rare in those days for people to receive their inheritance prior to their father’s death, but the father was willing to waste his money on his beloved son. The son went far away and spent it all quickly on parties, prostitutes, and booze (15:13, 30). When the money was gone and his entourage had left him, he found himself alone, eying the slop that he was feeding pigs. As Darrell Bock points out, “this was the most dishonorable work for a Jew, since pigs were unclean animals” (BECNT, 1996, p.1311). “Coming to his senses,” he reasoned that he would become a hired servant for his father instead of a hired servant for a stranger. For the lost son, the moment of repentance was when he determined “I will arise and go to my father” (15:18). Though the word “repentance” is not used in this parable, it is an obvious theme throughout the chapter as Jesus explains that we should rejoice as those in heaven “over one sinner who repents” (15:7,10). While most fathers would have disowned such a son and left him for dead, the Father was looking out for him every day to come home. “But while he was still a long way off, his father saw him and was filled with compassion for him; he ran to his son, threw his arms around him and kissed him.” (15:20) Notice the Father takes the initiative and runs out to him. Even before the son speaks, the Father forgives him and passionately displays his love for him (literally “he fell on his neck”). For the Father, the son’s return is enough to bring reconciliation and wholeness to their relationship. Unaffected, the son begins his rehearsed speech, but before he finishes, his father starts making plans for a celebratory feast. In today’s terms, the Father arranged for him to be dressed in a tuxedo, fancy shoes, and given a ring signifying his status as a son again. He even killed the cow that they fattened up to eat for only special occasions. For the father, this was a time for extravagant celebration. The older brother refuses to join the party and protests his father’s lavish treatment of his youngest. As a firstborn son, I can relate to him. Where’s the justice? You spoiled him rotten! He caused you nothing but pain and misery and this is how you repay him? Where’s my fat cow? The father gently reassures him that he is loved, he will always be with him, and “everything I have is yours” (15:31). The father is basically telling him that if he wanted a fatted calf or anything else, all he had to do is ask. Just as the father gave freely and even wastefully to the younger son, he was sure to give his older son everything he had. Once again, the father seeks reconciliation as he “pleads” with him to join with the family and workers at the banquet table. The story abruptly ends without any indication of what the eldest son decided to do. Will he join his brother at the table or continue to shun him, effectively making him the lost son? Jesus wants his audience to think about how we are like the older son. Are we shunning those who ask for forgiveness from us? Are we proclaiming ourselves righteous and yet refusing to associate with “sinners”? Are we going to continue to act like the older son or start acting like the Father? Webster defines “prodigal” as “one who spends money or resources freely and recklessly; wastefully extravagant.” In this parable, the lost son is certainly prodigal, but so is the father! He wastefully gives his son his inheritance, lavishes his son with love and forgiveness upon his return, and spends wildly on a party to celebrate his return. In fact, he goes so far as to say “we had to celebrate” or literally, “it was necessary to celebrate,” an indication that Jesus is not giving a suggestion to us to associate and eat with sinners, but He is giving us a vivid demonstration that we should follow. Will you be like the younger son who spends your money, time, and efforts pursuing “the life”? Will you be like the older son who judges sinners from a distance rather than helping them find their way home? Or will you be like the Prodigal Father, loving unceasingly and spending your time searching for reconciliation and “wasting” your efforts and even money to see people reconciled with each other and God?